Heat oven to 325°F. Grease large cookie sheet with shortening or cooking spray. In large bowl, beat brown sugar and butter with electric mixer on medium speed, scraping bowl occasionally, until well blended. Beat in 2 tablespoons beaten egg and the vanilla. On low speed, beat in flour, baking soda and cinnamon until dough forms. Stir in 1/2 cup finely chopped peanuts. Refrigerate dough 30 minutes. Crumble chilled dough onto cookie sheet. With floured hands, press dough into 14x10-inch rectangle. Brush with reserved 1 tablespoon egg. Sprinkle with 1/2 cup peanuts; press into dough. Bake 20 to 25 minutes or until dark golden brown. Cool 5 minutes; while warm, cut or break into 24 pieces. Instead of greasing the cookie sheets, use cooking parchment paper instead. 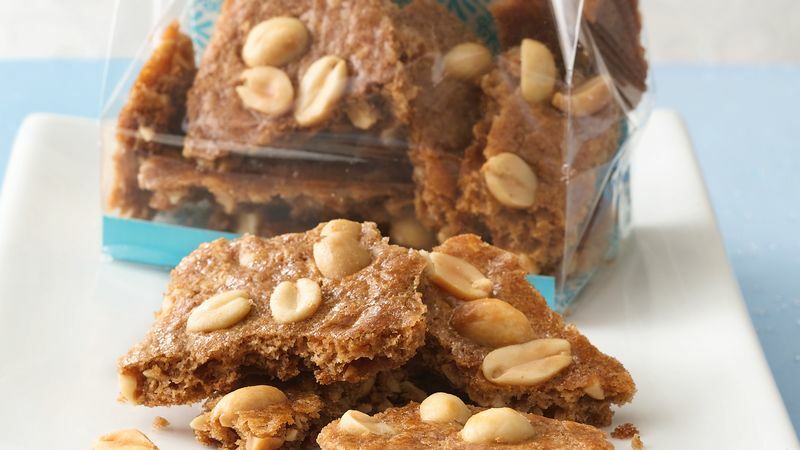 With all the great flavor of peanut brittle in an easy-to-make cookie, these cookies make fantastic gifts.